The "boss of me" cracked the whip today and made me finish the bunny I started last week. It really went through a transition! When I started it, it looked like an angry something-or-other but NOT a bunny! So today I put away my references and just painted by intuition. He has a soft look, almost as if he's being lulled by the scent of the lavender field. I know I would be! For now I'll list him on Etsy while I decide which shop should have him. You've described his expression perfectly! I'd also add that he carries a certain wisdom in the eyes. Oh what a lovely painting! Good you trusted your intuition! Nothing beats that. This turned out just perfect. Can you believe's I painted a lavender field at Martin this afternoon? He reminds me of Beatrix Potter and I expect him to start talking to me any minute now. An Art teacher once told me to look at your study and then put it way and just paint. Looks like it worked for you. He's a cutie. 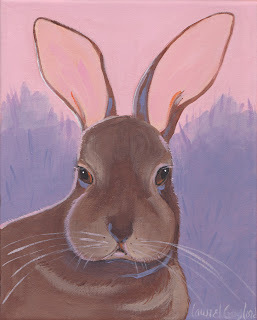 He DOES look like a Beatrix Potter Bunny....and a friend of Emily V.V. Rabbit! One day, I hope you will have the opportunity to illustrate children's books.... the world is missing out! What a sweetie. Thank goodness you have a strict boss. He is quite lovely! Soft and demure. Seems you are enjoying being the boss of you and getting art made! Hope it's fun. I love his fat little cheeks! bunny is so sweet and serious looking. perhaps contemplating all the Easter baskets he has to carry soon. cold and rainy here y'day, coolish but dry so far today. Hugs, suki oops actually yesterday was Wed and today is Thursday. I don't know how he looked to begin with, but he came out very sweet. OmG! he is so super-great! I love his puffy little snout and soft eyes. This is one cute BUN-BUN!!! What a sweetie...brilliant color palette choices! I have a rabbit obsession btw and this is absolutely wonderful. I just LOVE how the rabbit looks especially against the beautiful background! Wonderful job.